On this longest day of the year, we say a long, graceful goodbye to my co-worker John, one of my favorite eating companions and guests to the blog. Everyone from our department is sad to see him go. So, our band of seven heads to Van Dam Diner, a great place for big groups and lots of food. I ordered both an old favorite and a new thing this time around: Fried chicken waffles. Since the chicken tenders are pretty delish, my co-worker Crystal who got us all together; yay Crystal! ), also ordered the chicken tenders plate, but with fries. Other food ordered by the group was fried clams (John), a plain burger (Julia; she didn’t want the pickle), French toast with bananas (Lena), veggie quesadillas (Virginia), salad with chicken solvaki (David). But, back to the chicken tenders waffles…as stated before, it’s something new (waffles) and something familiar (chicken tenders). The sauces were maple syrup, butter and Honey mustard dressing, which was weird. As I drank my refreshing ice tea, I divided and conquered: I ate the tenders first (thus explaining their absence from the photo) with the mustard, then the waffles with the syrup. The tenders were excellent: golden, crispy, the meat tender and succulent. 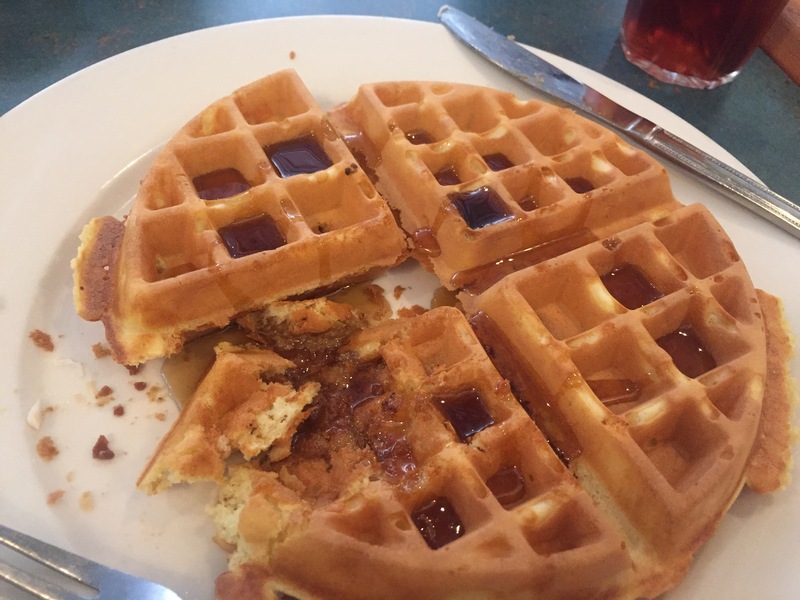 The waffles were the same, with their own sweet and crispy goodness. It’s like eating dinner along with breakfast, like they used to do it in Harlem in the Roaring ’20s, where they first served chicken and waffles to the weary jazz and blues performers at 4 am, when dinner and breakfast meet in perfect time. Losing John here at work, however, will never be in the perfect time; he is needed here, but the funding of his project is dried up. As we discussed library politics and touring Central America, I watched everyone at the table, laughing and smiling. I wonder when will be all together again…sigh.